I am not known for overt patriotism, but I am also not one to pass up an opportunity to celebrate. And isn’t it a happy coincidence that our nation’s birthday falls smack dab in the middle of berry season? We are surrounded by luscious reds and blues hanging from the bushes and trees throughout our neighborhoods and farms. To pass these by is a shame and perhaps even unpatriotic. My kids and I went on a west county adventure yesterday, and came home with a bag full of blueberries from Sonoma Swamp Blues (great spot to pick up super tasty local blueberries!). Most of them are destined for shortcakes with strawberries and cream, but I could not resist tossing a few handfuls into the blender to make these popsicles. 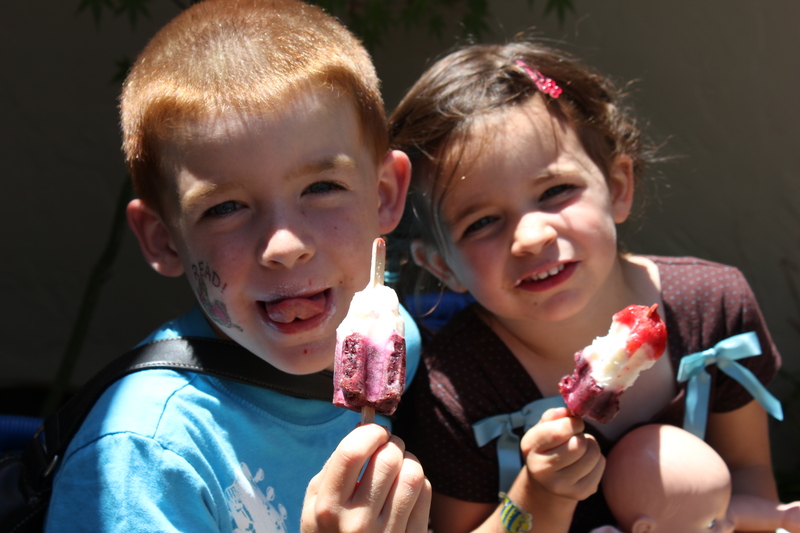 Believe it our not, my kiddos will happily gobble up a popsicle every day of summer! 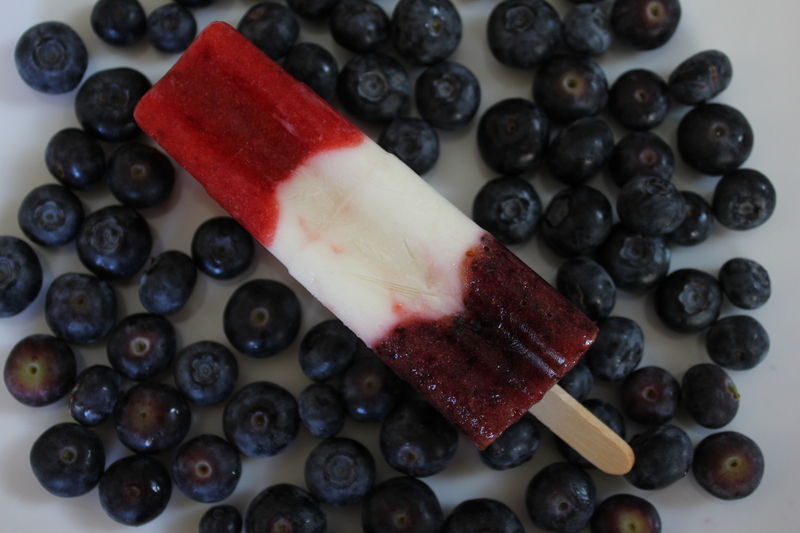 Red, White and Blueberry Popsicles are a tasty treat to cool you off while savoring the sweet tastes of July. Also they only take about 10 minutes to prepare (and freeze overnight), so you have more time to sit around sipping on lemonade (or an ice cold margarita). You can test your luck and pull them out of the mold after 4 hours or so. We did. Waiting until the actual 4th of July was more than our patience could take. Use caution though, if they are not fully frozen they are more likely to break off or for the stick to come loose from the popsicle. *Don’t have a popsicle mold? Check out this one. Wash strawberries. Combine strawberries with 4 teaspoons sugar and 2 tablespoons water in a blender or food processor. Process until smooth. Pour the strawberry mixture into your popsicle molds. Do your best to evenly divide the mixture, but don’t worry too much if there is slightly different amounts in each popsicle mold. Spoon the yogurt evenly into the popsicle molds on top of the strawberry mixture. Rinse out your blender. Wash blueberries. Combine blueberries with 4 teaspoons sugar and 2 tablespoons water in a blender or food processor. Process until smooth. Pour the blueberry mixture into your popsicle molds over the vanilla yogurt. Insert the popsicle sticks into the filled molds and freeze overnight until firm. If you have trouble removing the popsicles from their mold, run the mold under warm water for a minute or two and the popsicles should slip right out. If you do not have popsicle molds, you can use small yogurt containers, ice cube trays, or mason jars. Ohhh, Karen I love these popsicles! Berries and yogurt are always so good together. What a cute photo of your daughter…I can imagine your kids will be enjoying lots of frozen treats this summer. Happy July 4th! Perfect! Happy 4th to you and your family! Thank you, Lynda. I wish you a happy day as well! I wouldn’t have been able to wait until the 4th to eat these either! They are the perfect summer treat.